Do you know that feeling you get when you visit someplace new, and your gut tells you, yup, this is an environment that supports cultural expression, a place you know will provoke questions and challenge your assumptions? For me, that happened immediately when I stepped out of the taxi in Berlin and instantly start tripping over daring art and bold architecture. That’s when I knew I’d entered a public art city. On this, my first visit, I was struck by the city’s concerted effort to educate and brand itself employing art, signage, and architecture. Art is simply, everywhere. While a tremendous percentage of the contemporary permanent works are pensive and reflective of Germany’s uneasy past they all, overwhelmingly, challenge their viewer and provoke reflection. 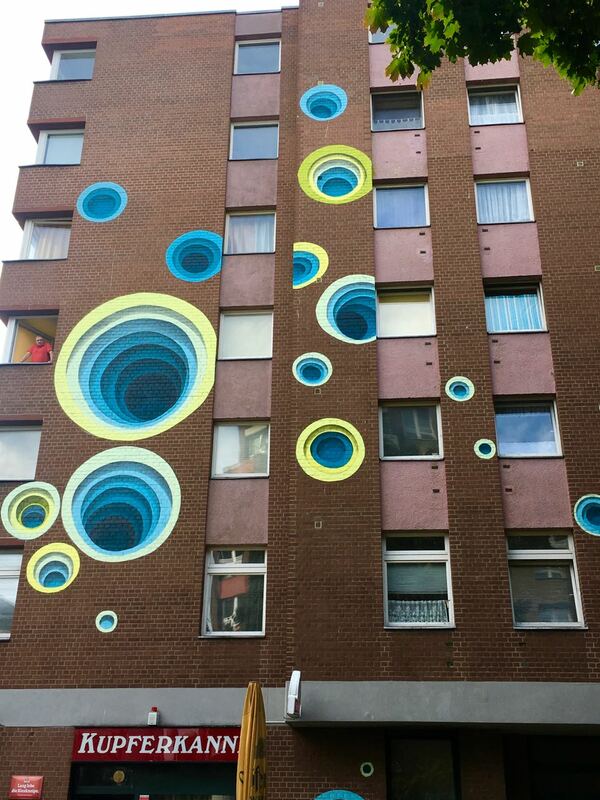 On the flip side is a youthful, contemporary (and perhaps more balanced) form of expression filling the streets. Temporary interventions and street art, as equally bold and risk-taking as their permanent cousins, can be found in every borough of the sprawling city. Reflecting a people and a past. The Reichstag projection, “To The German People”—projected in the evenings June through October on the side of the Marie-Elisabeth Lüders Building—encapsulates Germany’s effort to rip open its wounds and “bare all” through near-propagandist art. In a succinct yet moving 30 minutes, the variable history of Germany’s parliament is portrayed vis-a-vis the construction, destruction, repair, wrapping, and reconstruction of the Reichstag building, the imperial hunting ground turned seat of power for reunified Germany. In this scene, a projection of the Berlin wall begins to crumble and appears to fall into the water. Using audio, still photographs, found film footage and projection mapping, the installation presents a truthful history of the Weimar era, the atrocities of World War II, the division of Germany and its reunification. I happened to be there on the twenty-seventh anniversary of the reunification and as I watched with hundreds of young Germans, I felt their pride swell at the end of the film. Democracy is messy but worth fighting for. Pieces of the wall still exist such as this one in the redeveloped, commercial Potsdam Plaza. Education and text are played with a sometimes-heavy hand in Berlin as seen at the Neue Synagogue, one of a few synagogues to survive Kristallnacht. Other examples are more subtle and more effective. The brass Stolperstein, or "stumbling stones” by the German artist Gunter Demnig are a constant reminder of Berlin’s darkest days. With his foundation, Demnig installs brass plaques in front of the last known address of those who perished under the Nazi regime. Over 61,000 Stolpersteine exist in 21 countries in Europe, making the project the world's largest memorial. And of course, a visit to Berlin isn’t complete without a haunting walk in and among the stelae of The Memorial to the Murdered Jews of Europe, also known as the Holocaust Memorial, by Peter Eisenman. Much has been written on this 19,000-meter memorial, from praise to a critique of its inadequacy, but what I will share is the haunted yet peaceful feeling that washed over me as I passed through the undulating 2,711 concrete slabs and walked deeper and deeper into the subconscious of a troubled people addressing their shameful past. View entering the field of stelae. The view from deep with in the stelae. A stolen kiss in the park. Across the street Michael Elmgreen and Ingar Dragset's "The Memorial to the Homosexuals Persecuted under the National Socialist Regime" plays footage of what was once a forbidden act. 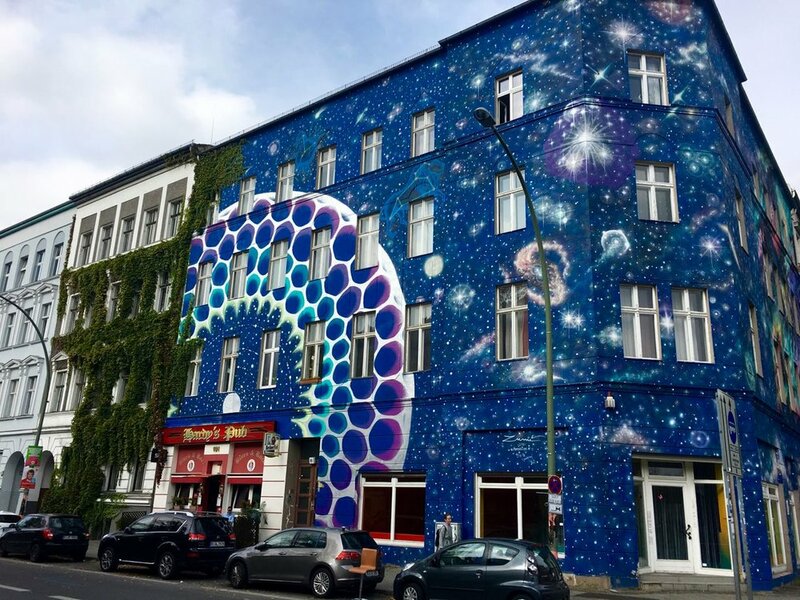 Throughout Berlin today one will also find vibrant murals and street art, a continuation of the graffiti-filled tradition started when youth began covering the west side of the Berlin wall. Today’s street art and the works exhibited in contemporary galleries suggest a new approach to “baring all.” These works reflect a globalized Europe sparked by a near-borderless EU and the cultural values imported by immigrants and political refugees. It reflects new faces, embraces artists from across the globe who share new points of view, and much of its content bears warnings. 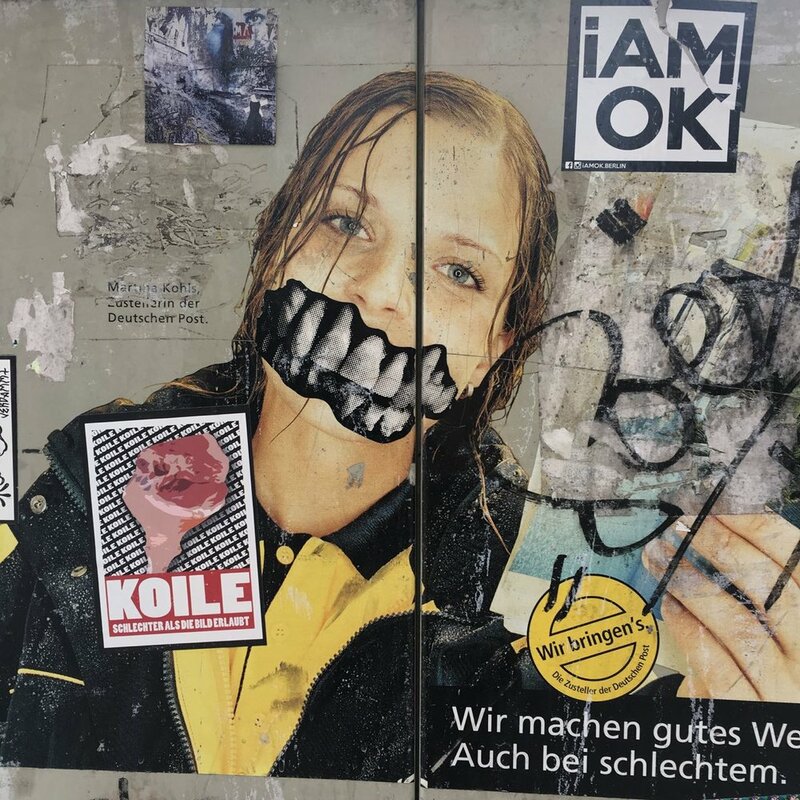 Berlin street art begs to be heard. It can stop you in your tracks. Most works pictured above were commissioned as part of the opening of Urban Nation, the world's first museum of street art. Shout out to our friends at Brooklyn Street Art for curating a stellar first exhibition! 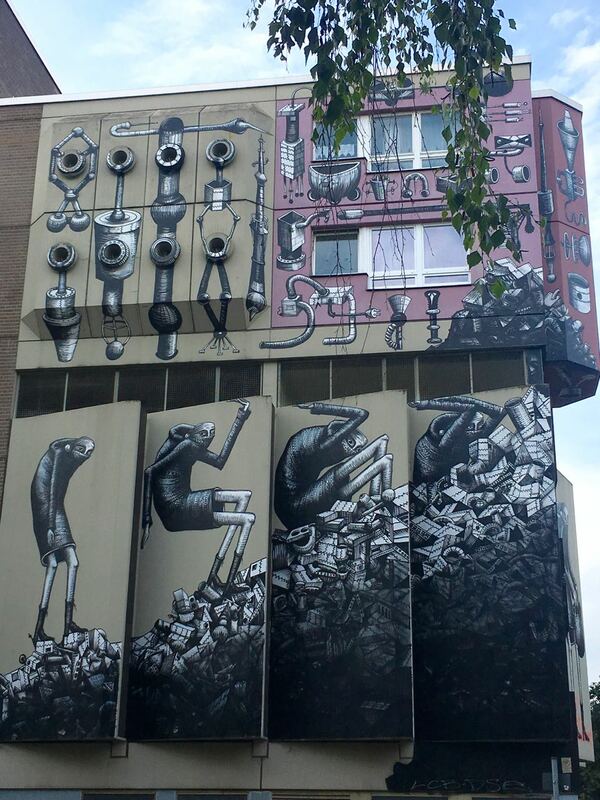 While it seems that street art is being threatened by gentrification, especially in trendy Mitte, and despite the city’s overwhelming adherence to order, there is an exciting undercurrent of experimentation and intellectual rigor that encourages continued experiments in contemporary public artwork. So why is Berlin so hospitable to the arts? And what does it take to become a public art city? For Berlin and many of America’s post-industrial cities, hardship can be a catalyst for change. Look no further than cities that are known for their mural programs such as Lynn’s Beyond Walls and Philadelphia’s Mural Arts. It takes leadership to build a public art city. Berlin commissions new work in much the same way many American cities (except Boston) do and they have a percent for art program. While I am not an expert in Berlin’s arts leadership, it is apparent that the city is careful not to stifle creative expression. Especially given it’s past. It allows for multiple points of view and encourages experimentation. Berlin somehow holds room open for the duality of youthful dissent and nationalistic commemoration to both be expressed. But most importantly, it takes passion. Passion for public art begets ardent demand for more public art. It’s a virtuous circle of support. Millions of tourists flock to Berlin each year for an injection of creativity and culture. What would it take to make Boston a destination for public art? At Now + There, we’re beginning this journey to build Boston into a public art city. We’d love to hear from you. What does it take to create a public art city? What do you want to see and where? Share your thoughts below or drop us a line.